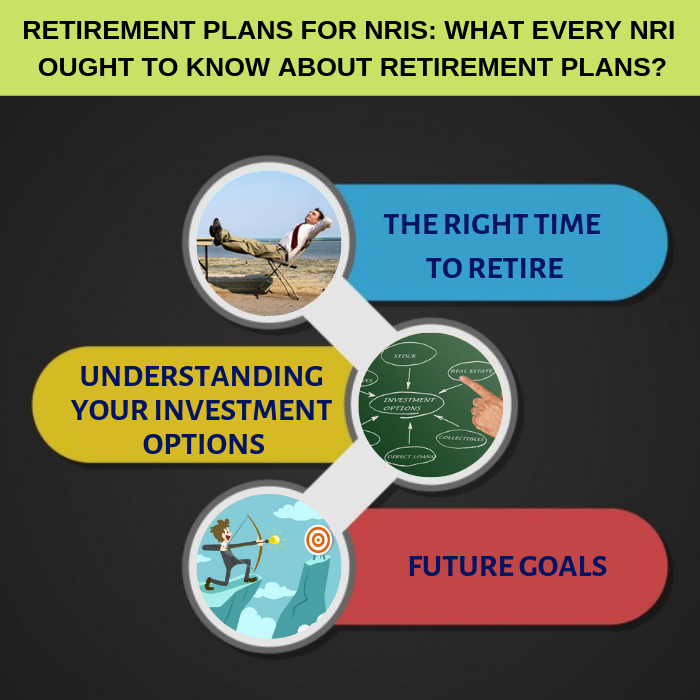 Retirement Plans for NRIs: What Every NRI ought to know about retirement plans? As an NRI, are you completely satisfied in the way you have been planning for your retirement? In the case of NRIs, there are some crucial pointers that determine the success or failure of a retirement plan . Key to that is whether you are heading back to India and when. As an NRI, it becomes more important to have a dipstick of various possible safer investments for when you retire and/or return back home. Consider these when making a retirement plan. Some of the NRIs have an age-specific retirement, while others choose to retire early . It is important to decide when you will retire and what you would do post-retirement. Targeting a retirement point allows you to work towards a timeline and plan your investments to meet that timeline. Most of the NRIs plan for early retirement when compared to Resident Indians. come back to their home bases or closest urban centres as this suits their familial and comfort needs. Going back to your ancestral village or to an urban city will have different implications and costs for everyday living. In most instances, NRIs leave behind their children who plan to build their own careers. So, it is essential to decide on your retirement plans according to the relocation site and how you see yourself supporting your children during their formative years and their life plans. Buying assets, saving for your children’s education and marriage, maintaining post-retirement lifestyle, planning holidays, and other future desires for things you always wanted to do need to be mapped out. This will give you a careful understanding of how much to spend today; where and when, and what to save for your future plans. Investments aren’t just about savings but are also means to make your finances grow for a time when you aren’t earning as much. Envisage that future and begin today. Depending on where the goals are to be achieved , in India or abroad, NRI can choose the currency in which he makes the investment. If the goal to be achieved is in India, then he can invest in Indian Rupees, so that maturity proceeds will help him meet the goal in Indian Rupees. If the goal to be achieved is in US, the he can invest in US$, so that the maturity proceeds will help him meet the goal in US$. This way, the currency fluctuations will not affect the NRI from meeting his retirement goals and other goals. You must have flexible investment plans to suit your retirement requirements. There is a huge array of investment options in the market and the challenge is to choose wisely for what works best for you. You should consider exchange rates, stability of returns and longevity of your investment options. Your investments should allow for the best possible tax benefits now and ideally tax-free income in future. Do remember that NRE accounts work better for remittances and investment planning. Also it is better to decide in advance about ‘do you need to repatriate the redemption proceeds or not?’. Always stagger your investments in such a way that the returns are spread over a period of time and does not result in lean patches, as critical moments like illnesses, eventualities, marriage and birth of grand children often come unannounced. It is advisable to consult a professional financial planner before taking the decision. As an NRI you need to choose a financial advisor who has got an online presence. You should be able to talk to him through video chat. The financial advisor should be in a position to advice you through exchange of emails. Facilitating the transactions online and online access to investment portfolio will really add value to NRI investors. Never make an investment without comprehending its pros and cons. 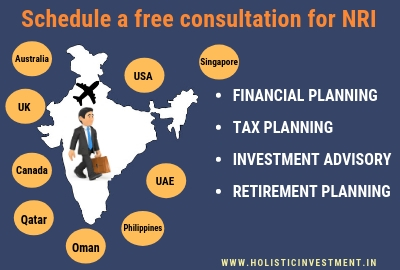 There could be a plan that works in a different way in a foreign country, and works completely different when chosen in India. So, the returns are also going to differ. Your freedom and retired life tomorrow can be made now using the right investments. So, move ahead towards the future backed by the right plan!